- Small production area : 4 tables which has 1 worker each to work in the basic 4 steps of producing a pewter products. This area is good to see but is small, therefore, must break into groups to view table by table. 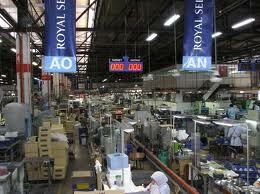 - The group then lead to the big production area of the factory – souvenir shop.